Looking through books of knitting stitches is always inspiring. If the knit and purl stitches are the atoms of knitting, then knitting stitches (also called stitch patterns) are the molecules. They’re essential to create shape and fit in garments, and are key to creating knits that surprise everyone with their seeming complexity. Of course, as the instructions in this ebook will show you, they’re not at all difficult to achieve. You just need to know how, as figuring it out could take you ages! 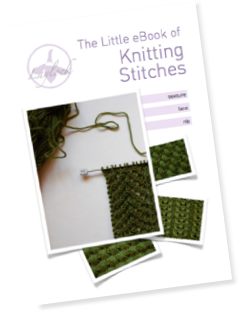 Knitting stitches are a brilliant opportunity to practice, learn new techniques, and begin to solve the mystery of how stitches create different fabrics. Simply enter your email address on the right and an email with the download link will arrive in your inbox. Don’t worry, I take your privacy very seriously and I’ll never ever ever spam you or share your information with anyone else!